Bed bug infestations have become more prevalent in Nashville in recent years. As one of the leading bed bug exterminators in Nashville, TN we have seen an increase in calls related to bed bug issues. Why Are Bed Bugs Increasing in Nashville? The answer is actually pretty simple. Population growth. Nashville has become one of the hottest (and we don’t mean temperature) cities in the country. More people are moving to Nashville every day, plus booming tourism and growth downtown is bringing more people from other cities and countries into Nashville than ever before. Nashville is not the only city in middle Tennessee that is experiencing this issue. We’ve also seen an increase in calls for bed bugs in Franklin and Brentwood, TN. This relates to the growth in bed bugs issues and infestations because bed bugs are more likely to be spread via luggage, backpacks, briefcases, mattresses, and used furniture. Many times the first sign that you may have bed bugs are small bites and itching on your abdomen. Bed bugs hide during the day but they come out to feed at night while you sleep so they are very difficult to see. Unfortunately, bed bug bites are not uniform in appearance and can affect people differently. Sometimes they can look and feel like a mosquito/flea bite and with some people the skin doesn’t react at all. Some people can react badly to bed bug bites with big welts that itch badly and can take two or three weeks to go away. 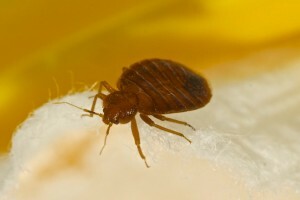 The only true way to know for sure if you have bed bugs is to schedule a bed bug inspection. Bug Authority specializes in bed bug inspections in Greater Nashville, Brentwood and Franklin, TN. Bed bugs are parasitic insects of the cimicid family that feed exclusively on blood. Cimex lectularius, the common bed bug, is the best known as it prefers to feed on human blood. A bed bug has 6 legs, if you notice a bug that has 8 then it is most likely a tick or a mite. Bed bugs have antennae that point forward and are on average about half as long as the body. Appearance – Bed Bugs are normally round and will be red in color and plump or fatter after feeding. Sometimes they look like “a drop of blood with legs”. At other times (not after feeding) they will be flatter and more of a reddish brown color. Size – Many people are not aware that you can actually see adult bed bugs. At full size they are normally 1/4 inch long. The eggs and babies are too small to see, normally around 1/16 inch in size, or 1mm. Life Cycle -Bed bugs start with an egg. The female bed bugs can lay between 1-5 eggs per day into tight cracks and crevices that are very difficult to see. After about two weeks the bed bug eggs hatch and you have a nymph. The nymphs begin to feed and go through 4 stages of growth until they become an adult bed bug. It is important when you are staying the night away from home (especially in hotels) to inspect for bed bugs. You can do they by looking under mattresses and behind bed boards for small red or brown spots. Inspect your luggage closely when returning home and wash and dry your clothing and linens on the hottest temperature available. If you purchase used furniture (especially beds) inspect it closely before bringing it into your home. Lastly, inspect your home closely after you’ve had overnight guests or service calls. Catching the problem quickly before it becomes an infestation is important when it comes to bed bugs. Think You Might Have Bed Bugs? Contact Bug Authority for Help. If you think you might have a bed bug issue contact Bug Authority at (615) 472-1292 or click below to request a quote.